Susanna Gelfand was born in Kazan, Russia 10th of April 1923. Her father Samuil Gelfand was from St. Petersburg and mother was Tanya Freidina. By the time she was 2 years old, the family moved to Moscow, Russia. She had an older brother Alexandr (Shurka) who died in WW2 (1943). Shortly afterwards, the family evacuated to Zolatorevka, Penza where she learned about weaving in connection with greatcoat cloth manufacture. 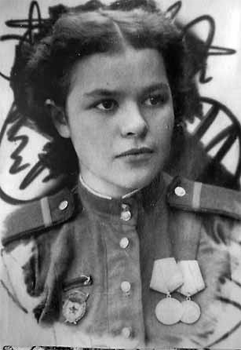 In the spring of 1942 Susanna was drafted into military service. Soon afterwards, her division was sent to Stalingrad, the site where one of the major battles of WW2 was taking place. In the beginning of 1943, she was attached to 27th unit where she served till the end of war. There she was calculating the locations of an enemy's army by decoding the sounds of shootings at different locations along the front line. She was wounded and was awarded a medal for bravery. In September 1944 her unit went to Vienna, Austria where the unit stayed until the end of the war in 1945. After the war, she came back to Moscow and got admitted to the same Moscow Aviation Institute. 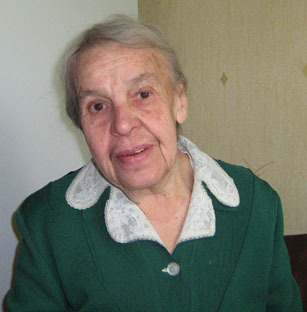 While in college, she got married to Jacob Shuvaev and had a son in Jan 1950 (Alexandr Shuvaev ) but shortly afterwards, she separated from her husband. After graduation (1951) she started working at the state's military factory that was manufacturing units for installation in airplane weapons. She was responsible for the department that was making smaller installation parts. She worked there her whole career and retired in 1983 (when my sister was born). She remarried in 1957 to Michael Lokshin. They had a daughter (my mom) Maria Lokshina in July 1958. Michael and Susanna lived together for 49 years till his death at the age of 93 in 2006. For me personally, Grandma has been very big part of my life. Her place always felt like the home where I felt accepted, supported and very valuable. I am eternally grateful for all the time she was around and everything she was for me. On Jan 16th my grandma was diagnosed with multiple meningiomas. She died on the evening of Feb 1st 2015.